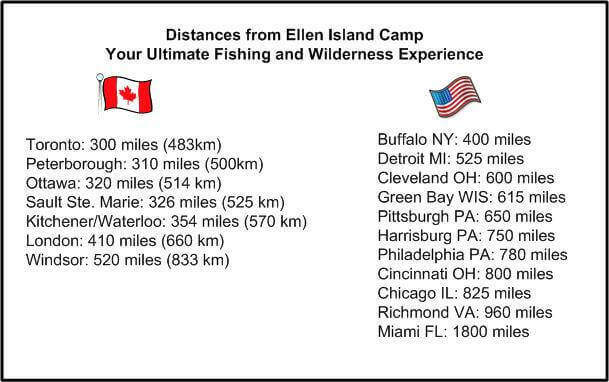 Ellen Island Camp is situated on Lady Evelyn Lake which is a remote Lake with no road access and over 450 miles of shoreline to fish and explore. 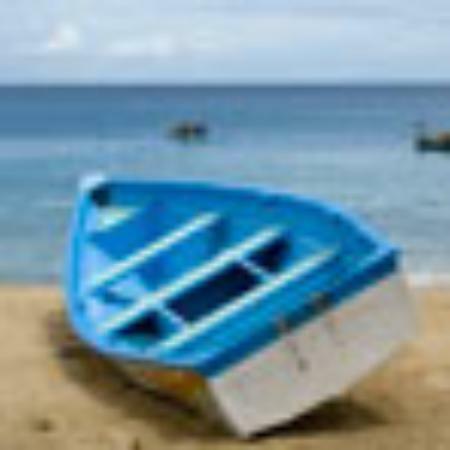 We look after the task of getting our guests to camp via boat. 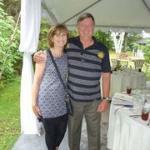 Your trip to Ellen Island Camp will be effortless after you arrive at Mowat’s Landing. 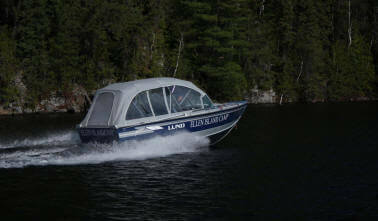 We take care of getting you and all your supplies from Mowat’s Landing to your cottage at Ellen Island Camp. 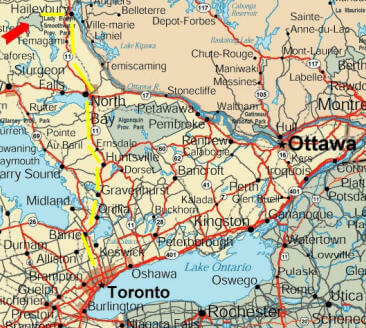 Your final driving destination is Mowat’s Landing which is about 5.5 hours north of Toronto straight north on Hwy 11 from Hwy 400. 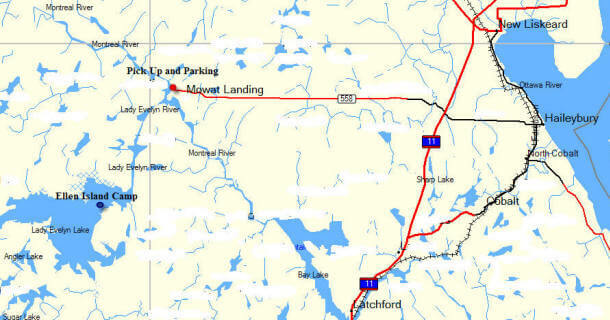 To get to Mowat’s Landing is quite easy, whether you’re coming from the North or South you will turn west off Hwy 11 (Trans Canada Hwy) onto Hwy 558 west (Mowats Landing Road) opposite the turn to Haileybury. The turn off from Hwy 11 is approximately 1.5 hours north of North Bay. (See map below). If you’re coming from the south on Hwy 11 watch for our Ellen Island Camp billboard just north of Marten River, from our sign your only 55 minutes to the Hwy 558 (Mowats Landing Rd) turn off. Hwy 558 west (Mowat’s Landing Rd) starts out as a paved highway then becomes a gravel highway for the second half, don’t worry the gravel section is actually nicer than the paved section. You’re travelling time on Hwy 558 west off Hwy 11 will be approximately 25 minutes to the end of the road which ends at Mowats Landing at the Montreal River. Unload your gear on the docks and leave the rest to us! At Mowat’s Landing we pull up with our luggage and passenger boats consisting of a 22’ Stanley Pulse Craft along with our 18’ and 20’ Lund Alaskan’s to load up all the gear. Don’t worry about how much stuff you have, we can handle it. Once were loaded, we begin the 30 – 40 minute trip to Ellen Island by boat. After we leave the Mowats Landing dock we travel a short distance across the Montreal River to the Mattawapika Dam. To get around and over the dam we have our truck and trailer on the portage to haul our boats loaded with all the gear. If you have mobility problems let us know, you can stay in the boat for the trailer ride around the dam, otherwise it’s a short 5 minute walk up the road to the harbour at the top of the dam to re-board our boats. This is a great moment for pictures of the dam and the portage operations. 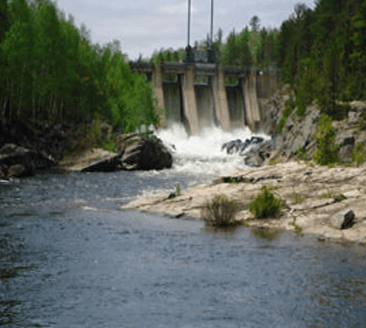 We depart the harbour at the top of the dam with our luggage and passenger boats for a 7 mile scenic trip up the Lady Evelyn River. Keep your eyes open and camera handy for the spectacular scenery and potential wildlife, as the odd Moose, Bear, or Bald Eagle have been spotted along the way. 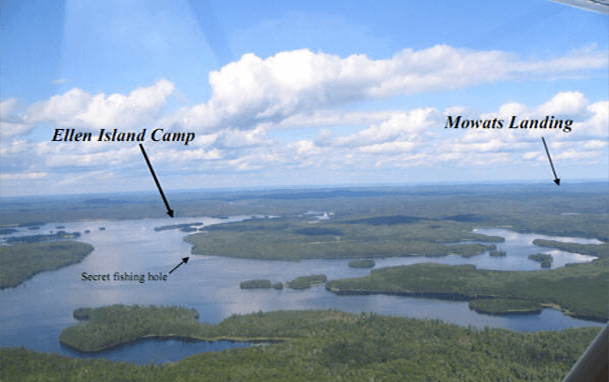 You will be amazed at the beauty of the scenery especially when we enter Lady Evelyn Lake and the vast openness with Maple Mountain on the horizon. 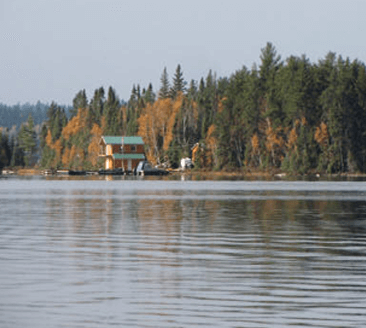 When we make the turn between the two small islands from the river to Lady Evelyn Lake, Ellen Island Camp is within site and 5 minutes to the back docks. We usually like to take the scenic route around the front of the island to show our guests a few of our favourite fishing spots and give them a feel for the location and size of our 17 acre island. 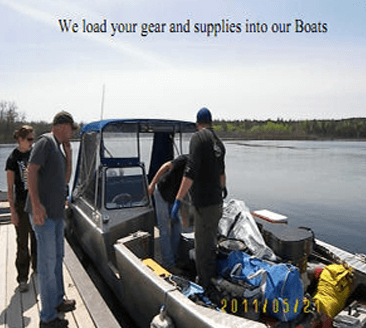 After we tie up to the docks, you will be given a tour of the facilities and how things operate on the island while our employees unload your gear and transport it to your private cottage. Once you’re settled in your cottage, it’s time to relax, grab your favourite beverage, and enjoy our northern wilderness.